Is Amazon losing the pricing war? Winning! Big stores are competing with Amazon, resulting in lower prices for consumers. Amazon better watch its back. Wal-Mart, Best Buy, Target and Staples are contending for its title as king of deals. Amazon has spent years building up the reputation as home to the lowest price -- and for a long time, it was. Its prices had many brick-and-mortar stores blaming the e-commerce giant for reduced sales in past years and creating the show-rooming phenomenon, where people would check out a product in store, but then buy it online for a cheaper price. But now, the tables are turning, and retail stores are gunning to compete for business. The pricing wars heated up with Wal-Mart (WMT) and Best Buy (BBY) unveiling price-matching policies and Target (TGT) offering free shipping on all online orders for the holidays. And Wal-Mart just announced it's slashing prices on Apple iPhones. Data from mobile shopping app ShopSavvy showed that on average, Wal-Mart is the cheaper option on more than 50% more products than Amazon and Best Buy, across all categories analyzed. "A couple of years ago, Amazon was the only one matching prices," said Mark LoCastro, spokesperson for deal aggregator DealNews. "But now other people are in the game ... Amazon is trying new tactics to keep people in their eco-system." According to DealNews, 29% of Amazon's best deals during Black Friday week were also available at other stores at the same price. In an e-mail to CNNMoney, an Amazon spokesperson said that the company is "obsessed with maintaining customer trust that Amazon will have the lowest prices possible." Finding the best deal depends on what you're buying. For instance, home goods tend to be cheaper at Bed, Bath & Beyond with its infamous 20% coupon than Amazon, according to Craig Johnson, president of Customer Growth Partners. Of the big retailers, Wal-Mart is still the leader in terms of lowest grocery prices, and an easy feat with Amazon not totally in that sector yet. 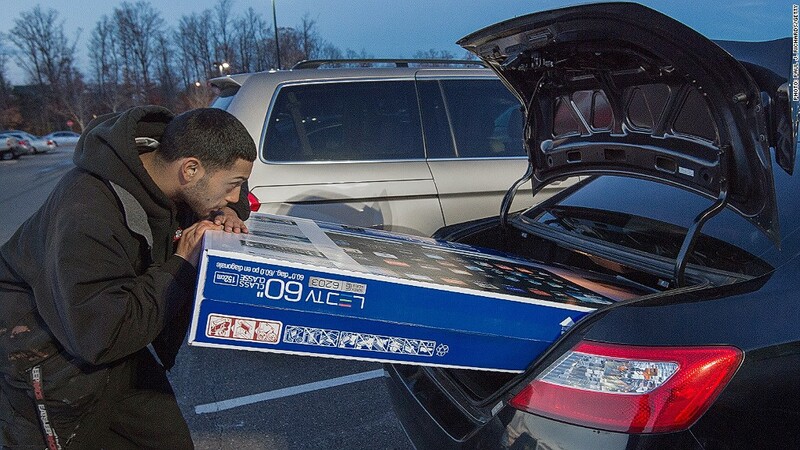 And if you're in the market for a big TV, Costco (COST) tends to have the best prices. "And then of course if you are a member, you get a 2% rebate at the end of the year, which can be pretty substantial with these purchases," said Johnson. When it comes to Apple products, Johnson said Target or Costco can bring the lowest prices. "Prices on those products tend to be fixed, but when you use the Red Card or get it at Costco you can get a certain percent off." The bigger the price tag, the higher the stakes for retailers. "When you start getting into the three or four-digit price tags, that's where retailers are really going to step up their offers to attract customers," said ShopSavvy CEO John Boyd. For smaller purchases, the experts pointed to Amazon as the best deal provider. Retailers are increasingly using software to help set prices. They can set up alerts for when a rival drops prices or have the system make sure their price stays with a certain margin compared to others. Some stores are even using digital price displays to be able to adjust price quicker," explained Jay Henderson, Director, IBM (IBM) Smarter Commerce. The price battle is far from over, but there's already a clear winner: consumers. "The longer they fight, the better it is for the consumer," said LoCastro.